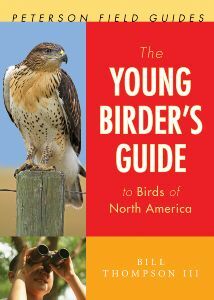 Birder and writer Bill Thompson III has produced a new paperback edition of The Young Birder's Guide to Birds of North America. This book builds on his 2008 book, The Young Birder's Guide to Birds of Eastern North America, which I reviewed at the time. These guides are aimed to engage young birders and help them learn the most common bird species before using a standard guide that might overwhelm them with information. The species accounts are less condensed than a standard field guide and focus on how to find and identify each species, along with unusual facts about their natural history. The new edition follows the same format as the 2008 edition, but it adds 100 western species to broaden the book's appeal. A study of Wood Thrushes shows that individual birds have surprisingly consistent migration times. Migratory birds time their migrations to arrive at migratory stopovers and their breeding grounds at optimal times for food availability. This means that climate change may throw off their migration schedule in the future. 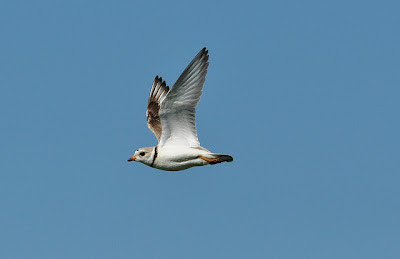 Piping Plover numbers are rising on Cape Cod thanks to beach closures that allow nesting to take place without human interference. 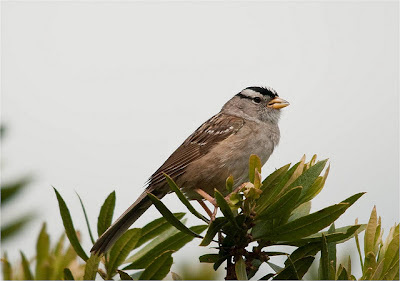 Even when an endangered bird is listed, the US Fish and Wildlife Service may not designate sufficient critical habitat. Brown Pelicans have been attacking a Common Murre colony at Yaquina Head in Oregon, leading to the deaths of hundreds of murres. 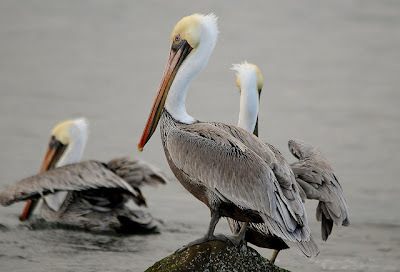 The pelicans either eat the chicks or shake them until they regurgitate their food. The attacks by the pelicans have encouraged further attacks by gulls and crows once the parent murres have been chased from the nest. Hummingbirds are able to fly in the rain by changing their flight posture and beating their wings more quickly. Breeding populations of wading birds in the UK continue to decline. While much of the US is mired in drought, the UK has experienced an unusually cold and wet summer, which means a bad breeding season for Common Swifts. A recent study used the fable of a crow dropping stones into a water jar to explore cognitive differences between crows and young children. A recent study argues that Northern Spotted Owls would benefit from more active fire management. Past Olympics included pigeon shooting — real pigeons, not clay pigeons. 10,000 Birds: Plovers, they’re harder than you think. Sibley Guides: Why are Yellowlegs hard to identify? This month, nearly the entire Greenland ice sheet experienced some degree of melting. Such widespread melting is highly unusual; in most summers only about half of the ice sheet's surface area experiences melting. The World Wildlife Fund issued a scorecard for 23 countries based on their compliance with CITES. Images from 40 years of LANDSAT show the disappearance of the Aral Sea, one of the worst manmade environmental disasters. Despite ample warnings about the toxicity of the Anacostia River, many DC residents continue to fish there and consume fish from the river. You can watch brown (i.e., grizzly) bears try to catch salmon in Alaska's Brooks River on a live webcam. Monarch butterflies fly better when they have darker wings. There is talk of buildings a CSA on top of a former Superfund site in Portland. This week, July 23-29, is the first ever National Moth Week in North America. Moths are widespread and diverse insects, capable of adapting to many niches and with significant ecological and economic effects. They range in size from micromoths barely bigger than a pin head to giant silkworm moths whose wingspans may measure several inches across. Most are patterned with shades of brown and gray, but some are brightly colored, and even moths with camouflaged forewings may conceal dazzling hindwings underneath. Since moths can be found anywhere and studied without a lot of special equipment, it makes them a natural subject for a citizen science project. Indeed, a National Moth Night has taken place in the United Kingdom for several years. Anyone can participate in National Moth Week by attending a scheduled public event or by looking for moths themselves. There are currently events scheduled in 20 countries and 49 U.S. states; check the map at the link to find events near you. To study moths on your own, register your location and then leave a light on outdoors at night. Ideally, this would be a bulb that shines into the UV spectrum, like a mercury vapor lamp or blacklight, but even regular bulbs will attract some moths. The light should be near a landing zone, like a wall or a light-colored sheet. Check periodically to record what moths have come to the light and photograph any interesting ones for identification. Here are some suggestions for submitting data. Three websites have set up data collection projects for National Moth Week. In addition to being one of the hottest and driest summers on record in the U.S., summer 2012 has been an irruption year for Dickcissels, which are being recorded well outside their usual range. A Traffic investigation charges that the Solomon Islands is a hub for illegal trade in captive wild birds, including numerous endangered species. According to a study, European Storm-Petrels are able to smell whether another bird would be a suitable mate. Over 500 dead Magellanic Penguins have washed ashore in Brazil over the past few weeks; the cause is still under investigation. Here are some photos of American Flamingoes (Phoenicopterus ruber) in the Bahamas. The US Fish and Wildlife Service has doubled the designated critical habitat for the Western Snowy Plover. A British ecologist has been studying the nesting guillemots on the island of Skomer for the past 40 years. In that time the guillemot population on Skomer has recovered from 2,000 to 20,0o0 individuals, which is still short of the estimated 100,000 guillemots that bred there historically. The UK is having a terrible summer, but the rare Ospreys at one nature preserve are doing well. Insect Museum: Insect Minute – What is the biggest insect? Bill McKibben lays out some hard numbers about climate change and its likely effects. A new study lends support to the idea that carbon dioxide could be sequestered by dumping iron filings in the ocean. The filings would encourage algae blooms, and when they died, the algae would sink deep into the ocean, taking the carbon with them. However, greenhouse gas emissions would still need to be reduced, even with this geoengineering method. The effects of climate change are not necessarily straightforward and vary from one location to another. Some mosses reproduce more effectively when springtails help transport sperm from males to females. Giant Swallowtails have been discovered breeding in Montréal, far north of their historic range. Invasivores are encouraging anglers to catch and eat invasive snakehead fish. With a growing population that depends on groundwater, Maryland has had to drill deeper for its drinking water. New analysis shows that those deeper aquifers were filled between ten thousand and two million years ago, and thus are unlikely to be replenished anytime soon. Long mating sessions leave dumpling squid exhausted and more vulnerable to predation. New York City is considering proposals to create a green roof for urban farming on top of the Hunts Point food distribution center in the Bronx. An iceberg twice the size of Manhattan broke off the Petermann glacier in Greenland. Woodbridge High School students will help with habitat restoration at a former industrial site along the Raritan River as part of an EPA program. Newark and New Brunswick both broke high temperature records this week as the historically hot summer continues. EarthFix reports on how various rivers in the Pacific Northwest still fail to meet the standards laid out in the Clean Water Act. A new study of King Penguins found that normal tourist activities like walking up to penguins and photographing them can stress the birds, especially in colonies unused to human contact. The study recommends that ecotourists watch with binoculars at a distance. A better nonlethal solution to aircraft collisions may be on the way; a new study shows that geese react faster to an aircraft with lights on than one without lights. The US Fish and Wildlife Service is reviewing whether the Black-capped Petrel needs protection under the Endangered Species Act. Babblers that help other birds raise their chicks in cooperative breeding arrangements are most likely to help close kin. An expedition to Angola found several tracts of bird-rich old-growth forest; several rare or declining species were found among the birds there. The Boston Globe posts lists of bird sightings on Cape Cod. NRDC's OnEarth Magazine has two articles this week on the western wild fires. One, by a former firefighter, argues that climate change plays a key role in increasingly severe fires. The second looks at the role of firefighting. Some commentary on the recent articles linking fires and heatwaves to climate change is available here and here. A California man waged a successful campaign against Ortho to persuade the chemical manufacturer to remove Monarch caterpillars from its pesticide advertising. The World Geography website has photos of wildlife overpasses around the world. Wildlife overpasses are bridges placed over highways in major wildlife areas so that animals can cross the highway without having to navigate fast-moving traffic. The USDA has declared the largest natural disaster area ever due to this summer's drought. The drought area covers over 1,000 counties in 26 states — basically the entire southwestern third of the country from California to the Mississippi River, part of the Midwest, and most of the Southeast. The heat this year has been so extreme that June set a record for the hottest 12-month period in history, for the third month in a row. My source of water, the Delaware and Raritan Canal, is taking a beating from the prolonged hot and dry weather. Black bears are being seen in South Brunswick Township near Kingston. Several New Jersey counties are using native copepods to control mosquito populations; the tiny crustaceans eat mosquito larvae. Hawk Rise Sanctuary in Linden, New Jersey, was opened just this past May. It incorporates the land around the former Linden Landfill, which is being remediated into wildlife habitat. The 95-acre site includes grassland habitat on the landill proper, a salt marsh on the north side of the Rahway River, and a small patch of deciduous woods. There are currently 1.5 miles of trails, with more trails planned. I was there yesterday to check it out. In a little over an hour, I observed 40 bird species, which I think it pretty good for a refuge of this size on a blisteringly hot day. (I made sure to finish up before the worst of the day's heat arrived.) The birds were mostly characteristic wetland species: Red-winged Blackbird, Spotted Sandpiper, Marsh Wren, Common Yellowthroat, and so on. 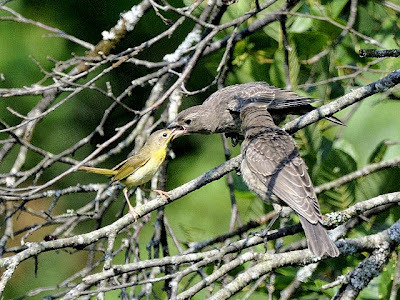 The most unusual sightings were a half-dozen Purple Martins flying over the landfill and a single Boat-tailed Grackle that flew across the creek that meanders through the sanctuary. The grassland on the landfill looks large enough to attract grassland specialists (both now and in winter), but for now at least it is closed to the public except for a short trail between the landfill and salt marsh. An early-morning walk there in May could produce some interesting sightings. Restoration of wildlife habitat in the sanctuary is still in progress. Preparation for the opening in May included planting native understory shrubs in the forested parts of the sanctuary. Many of these are still tagged with pink ribbons and occasionally temporary labels. I noticed rhododendrons, viburnums (pictured right), highbush blueberry, various ferns, and mayapples, among other things. Some of the plants looked stressed, probably due in part to the ridiculous heat waves we have experienced in late June and early July this year. One habitat problem the sanctuary is still dealing with is invasive species. Phragmites seems to be the dominant wetland plant, at least from what I could tell. Other invasive species I saw included Japanese Knotweed (one of the world's 100 worst invasive species), Purple Loosestrife (another from that list), and Canada Thistle. Fortunately none of them are there in huge numbers. For more on the Hawk Rise Sanctuary, see New Jersey Audubon, the NY-NJ Trail Conference, and Gone Hikin' blog. Wind tunnel tests that mimic high-altitude conditions are exploring how Bar-headed Geese are adapted for flying over the Himalayas. Treadmill tests showed that Rock Ptarmigans are just as fit after fattening up for the winter as at their (lighter) summer weight. If they survive their first year, guillemots are able to stay fit and active into their 30s with little deterioration in their abilities. Scientists think they have found the genes that allow parrots to mimic sounds. The endangered Hawai‘i Creeper, Hawai‘i ‘Ākepa, and ‘Akiapōlā‘au have been found at lower elevations for the first time in several decades, which suggests that the birds may be developing resistance to diseases that contributed to their decline. An Arizona mining company will pay a fine of $6.8 million for the deaths of migratory birds that were killed by drinking acidic water at one of the company's mines. The record-breaking wildfires in the Rocky Mountains and Southwest are probably exacerbated by climate change, which causes drier conditions and hotter summer temperatures in those regions. Brown widow spiders are expanding into the black widows' traditional range. Brown widows' venom is somewhat less toxic than black widows' venom. How white-nosed syndrome affects bat populations depends in part on how social a species is at its winter hibernation sites. The most gregarious species tend to be hit the hardest. Federal officials are still trying to rid the Delmarva Peninsula of invasive nutria, a mammal similar to native muskrat and beaver. Nutria are a concern because they can defoliate large expanses of marsh, which then become open water.